Bhavya Heights Society has complained that the point of entry and exit staircase at Wadala monorail station is blocking the access of fire brigade in the society. Mumbai: Once again the Mumbai Monorail is in the argument. Bhavya Heights Society, a housing society in Wadala has complained that the point of entry and exit staircase at the Wadala monorail station is blocking the access of fire brigade in the society. This housing society has now moved to high court which has castigated Mumbai Metropolitan Region Development Authority (MMRDA) and Brihanmumbai Municipal Corporation (BMC) for not working in an organized way which has resulted in such situations. Now the court has said and directed the authorities further to assure that the other monorail project from Jacob Circle to Chembur will not have such problems. The residents of Bhavya Heights Society, Wadala depot has said MMRDA to move the existing staircase towards the south side of as it is an obstruction for the entry of fire tenders, all these petitions were heard by the bench of Justices Naresh Patil and Girish Kulkarni. The society filled the petition after they got a letter from the Mumbai fire brigade informing about the inability to douse any fire in the society premises as the staircase was proving an obstructing. When the matter came up for hearing, the MMRDA and BMC pointed fingers to each other direction but the court blamed the civic body for not taking attention when the staircase was being constructed and looked into that only after its completion. The bench also scolded MMRDA for not keeping the civil corporation in the coil when the staircase was being constructed. After all the hearings, the MMRDA assured the court that it will find some alternative for the existing staircase and ensured that the society will not be blocked. The society suggested shifting the staircase to the south end of the stations whereas the bench suggested a skywalk to which the MMRDA said that it will take decisions only after consulting its officials. The court accepted their submissions and has placed the matter for hearing after 4 weeks. A fire department is yet to give the NOC to the Dadar station of the Mumbai monorail. The issue about the fire tenders which will go through the narrow lanes which the monorail passes is yet to be resolved. Compensation of nearly Rs 1200 crore is demanded by Scomi Engineering which was contracted by MMRDA to provide rakes and run the services of Mumbai Monorail. They have asked for this contract because they have invested over and above the contracted amount. Since its inception in 2005, Mumbai Monorail project has faced many problems like land acquisition issues and permissions from various authorities and agencies. In 2014 phase 1 was finally completed the services between Chembur and Wadala started. 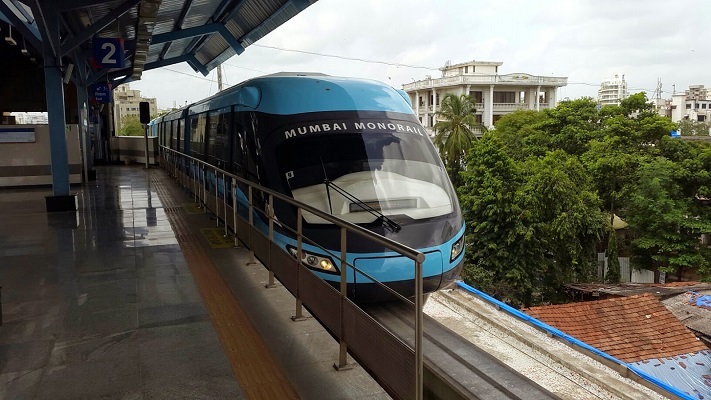 For the trial runs of Mumbai Monorail between Wadala and Jacob Circle and between Chembur and Wadala the monorail has 10 rakes which were utilized for these trials. Scomi said that there are four more rakes are there which are needed to be modified to be in service.